74-1/2″ discharge height, 30″ reach. 56″ clear beneath rotary valve discharge. Designed for drums from 23″-24″ diameter x 34″-36″ high. Fork style skip with drum locator accepts drums at floor level. Includes Control Link™ Rotation System for smooth 180º rotation. Carbon steel tubular frame with continuous welds. MTS hydraulic Lift & Seal System™ seals drum to the pour cone for dust-tight operation. 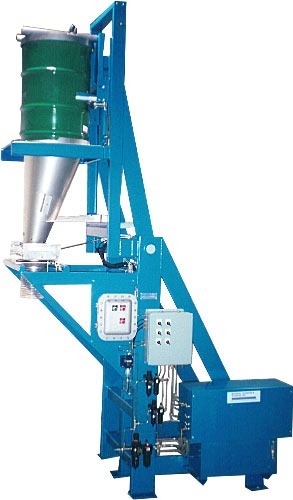 Includes pneumatic drum impactor system. 304-2b stainless steel pour cone, with continuous TIG welds, product contact welds polished smooth. 8″ diameter pneumatically actuated orifice slide gate. Designed for Class I, Division II, Groups D & F environment. Intrinsically safe air motor driven hydraulic system. Includes momentary contact intrinsically safe controls. Rigid stainless steel hydraulic lines used where possible. Includes NEMA 7/9 controls for rotary valve.